IBM's predecessor -- the Computing-Tabulating-Recording Company -- acquired the Ticketograph Company of Chicago in 1921, and it became a division of IBM in 1933. The Ticketograph was a device for controlling job labor costs and production activities by employing a coupon system of wage payments. It also could be used to track the flow of important documents and files throughout an organization. 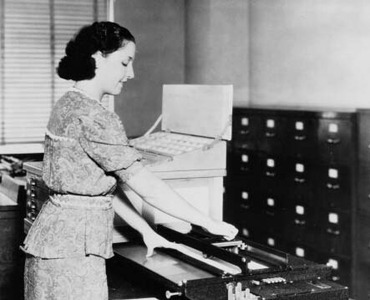 This engineering laboratory photo shows a development model of the IBM Ticketograph in 1937.The Ticketograph machine was used to simultaneously print on a set of coupons the wages to be paid for a given production lot. As work on that lot progressed, the workers would remove the coupons corresponding to their respective tasks and present them as vouchers for pay. A flexible arrangement on the Ticketograph provided an unlimited range of price schedules, and, as shown below, the machine's operator could set up any combination of rates. 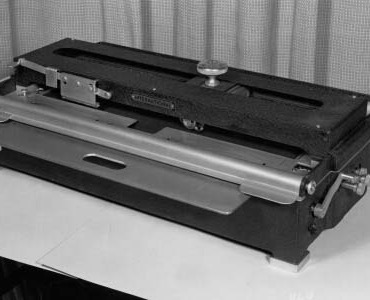 IBM offered the Ticketograph in Style 842, Style 844 (of dual construction, with one section of the machine used for all numbering purposes and the other used for pricing and other printing), Style 847 and Style 849 (which, like the Style 844, had two impression heads but contained 12 control levers for greater flexibility).